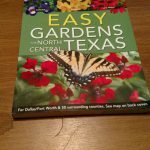 Easy Gardens for North Central Texas is primarily authored by Steve Huddleston. The senior horticulturalist with the Fort Worth, Texas Botanic Garden, Huddleston is a noted authority on plants in that area. The title suggests “Easy Gardens” and that is the common thread through the book. Though written as a regional book on the North Central Texas area, it can be used by gardeners in areas with similar climates. Attention should be paid to the soil and moisture conditions of your area in relation to those in the book. There is a large amount of information on various soil, rainfall, and climate requirements of various plants. The reader just needs to find plants in the book that match these factors in their area. The North Central Texas region is a fairly large area, encompassing roughly 50 counties and covering Hardiness zones 7 and 8. Most of the Southeastern United States falls into these two zones. The book opens with a section on gardening basics. Among the topics covered are areas such as drainage, soil preparation, plant spacing, watering, and fertilization. 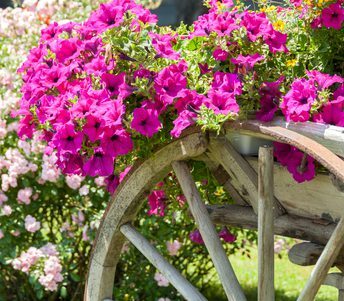 It’s main purpose is to give the reader a working list of plants that are easy and most suitable for their particular landscape. 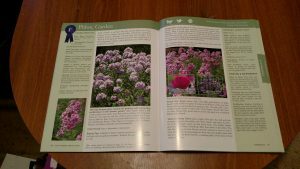 Every plant listed in the book is a suitable candidate for North Central Texas landscapes, though each plant is not suitable for each landscape. The good thing is that the detailed descriptions provided in the book remove most of the confusion and uncertainty that often accompanies landscape planning and plant selection. Plants in the book are given ribbon ratings, with the absolute best rating a Blue Ribbon, and those just below a Red Ribbon. The ratings are based on factors such as the maintenance required, adaptability to the Texas climate, how much water is required, and susceptibility to insects and other pests. Blue Ribbon and Red Ribbon plants are listed alphabetically. Also listed are other plants that, while perfectly suitable for most landscapes, do not quite rate a Blue or Red ribbon. 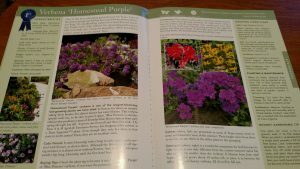 In all there are over 120 different annuals, perennials, shrubs, vines, and trees that have been devoted a full two pages of descriptive information and colorful images. Just about every detail related to that particular plant is covered. In addition, over 90 other plants are included in thumbnail description. There are two main benefits to this book. First, in most cases you can literally take this book and plan your entire landscape. With a little basic information about your area, such as sun and shade patterns and soil conditions (pH factor), you can find Blue Ribbon plants that you really like that will also be easy to care for. It applies whether you are only looking to work a small area or you are landscaping an acre or more. Plus, you will know what the plant looks like in bloom or maturity. Second, the book has hundreds of beautiful, stunning colorful photographs of all of these plants. So you will be able to see what they look like without having to leave your house. When you go to the garden center or to the online retailer you will know what you are looking for. You will know what the plant looks like in its blooming stage or at maturity. There are no major negatives in this book. It only briefly touches on grasses and groundcovers, and it does not cover vegetables or herbs. My other small quibble is that it doesn’t devote enough detail to the wide variance of North Texas soils. The range targeted in the book spans a wide territory, and soils vary greatly within this area. Some plants in this book will grow better in one part of the range and not so well in another. I believe the book could do a better job of identifying this aspect. This is a fantastic book that can be used as a planning guide for years to come. Plant purchases and landscaping ideas will not be a problem with this book. Though directed for North Central Texas, it can be used by anyone within the hardiness zones the book targets. You will need to know your temperature, rainfall, and soil conditions when looking over the suggested plants in this book. This is a book I would highly recommend.